The Environmental Protection Agency’s nationwide RadNet system monitors the nation’s air, drinking water, precipitation, and pasteurized milk to determine levels of radiation in the environment. RadNet sample analysis and monitoring results provide baseline data on background levels of radiation in the environment and can detect increased radiation from radiological incidents. 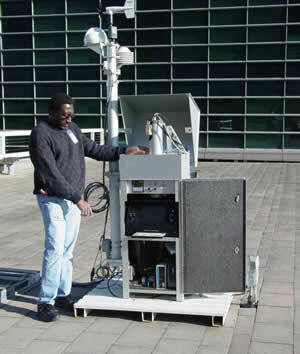 One such monitoring system is located in Carlsbad NM and monitors the air in the Carlsbad area. This data can be viewed at the EPA RadNet page.